- especially due to the non-cognitive nature of the bio-psycho-physiological dynamics occurring ‘as’ Beige. As three active CHEers, we noticed that in the practices around Spiral 3.0 (How are we being healthy in the Spiral?) SDi-ers often jump over the first meme Beige and start with Purple. We feel the need to really ‘begin’ with Beige, because it is so fundamental to the entire Spiral ‘dynamics’. There is a tendency to represent Beige ‘dark parts’, the unhealthy aspects. So, we decided to open up into the other parts, the ‘beauty’ of Beige-ness. We started an Inquiry into the Beauty of Beige as the BoB research team. Over the course of this past year, we have actually allowed ourselves to be in the tension of ‘not knowing’ and opening into being ‘explorers’ to discover, to reveal, to allow emergence to actually emerge something for, within, and between us as well. That is a very different dynamic of holding potential for evolutionary capacity-building. It is qualitatively probably part of what is essential in us. As change agents looking for ways to support integral societal renewal with SDi, we are continously learning about how-to-learn as an inroad to reaching people in communities. Our intellect is not always our best friend when it comes to that. Often we don’t ‘allow’ ourselves to have full embodied experience because our head kicks in making ‘a judgment of it’ and that takes us away from the process. Are we aware of that in ourselves and in others? What often happens is that ‘because I jump-quickly-to-making-meaning out of my experience, I tend to jump-over-Beige-ness’. Beige is about ‘the energetics’, the impulsive influences. If patterns sourced in Beige get re-triggered they could easily be showing up, expressively through different memes based on different contexts and conditions ‘to make the meaning’. It really is that simple, and it happens at lightening speed. But, without me being aware of that, without that full embodiment, our system – as indicated by the UR quadrant of the Integral model – would be unable to fully ‘re-wire’ the neuro-biological reorganization when moving up the Spiral. For further understanding of Beige as BoB team, we attempted to use some frameworks like CHE’s Integral Research Mode, that we also used in the Turquois research ://www.humanemergence.nl/uploads/2013/03/Turquoise-Research-Project-Phase-1-Report.pdf . One of our conclusions is to realize that we use a framework to ‘look at’ something; while Beige is a quality of ‘viewing from’. This is an essential insight for practitioners. When practioners are holding space ‘for’ something/someone, they are already holding space ‘in’ themselves in a particular way – either with awareness, by design, or outside of awareness, by default. If they are already on their own habitual, fear-based patterning of holding in themselves, then they will almost automatically project that into the spaces which they hold (outside). If change agents design for 2nd Tier potentials, we have to be able to hold the spaces in ourselves energetically of all 1st Tier qualities, and be aware of our own Beige. Otherwise, it will become a natural constraint and eventually a limitation. Frameworks can give us insight into ‘how change happens’ but not how to go about ‘changing’ as a result of what happens. If we are going to make ‘a giant leap’ as Graves indicates, it seems to us as BoB team – qualitatively and experientially – this Beige exploration is essential ‘capacity building for capacity builders’. That if we miss that piece, we are only able to build capacity (for others) within the limits of our own (capacity) and that may be insufficient to the complexity and emergence in the world today. This Beige inquiry process might in some ways qualitatively be the basis for and the source of potential for recalibration that is neurologically and biologically based. When that happens, ‘changing’ actually produces change. Change in my potential, change in my evolution, change at a cellular and probably at a genetic level. 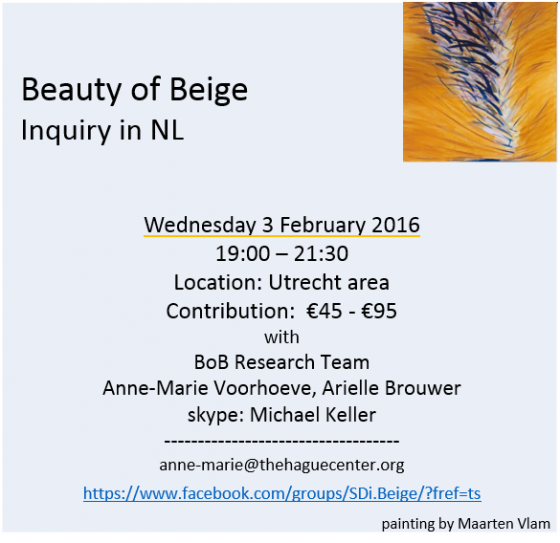 On Wednesday 3 February 2016, 19:00 – 21:30 pm (Utrecht area) the next inquiry gathering in NL will be held in which we will share more of our own intensive personal explorations, sources and include exercises for embodied experiential investigation, embedded in a holistic state of presence and integral awareness.